Seasonality arguably plays the most important role when it comes to conceiving a new menu. Harvested in their prime, these ingredients guarantee freshness and rich flavours that can shine in the simplest of dishes. Gastronomy aside, it makes perfect business sense to exploit the season’s best as much as possible. Vegetables grown in abundance during these few months tend to be priced better than the other periods of the year. 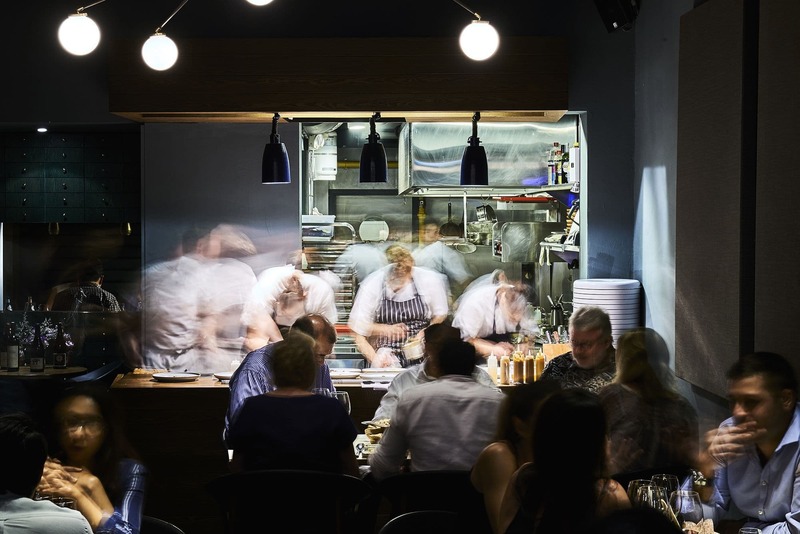 It’s a win-win situation for restaurants, especially when enticing diners to come back. But in an ocean of new offerings, such menus are becoming a dime a dozen. Singapore Laksa with squid noodles, best eaten with chopsticks. This is why Cure’s latest autumn menu comes as far more meaningful. Here, chef Andrew Walsh uses seasonal ingredients for a worthwhile cause: to be sustainable. He also goes through great lengths to source ingredients locally while sticking to his bistronomy cuisine. Admittedly, the range of such produce available can’t be compared to other locavore concepts in the region. Still, it’s a considerable attempt in making a more environmentally-friendly menu especially since as many parts of an ingredient are used. 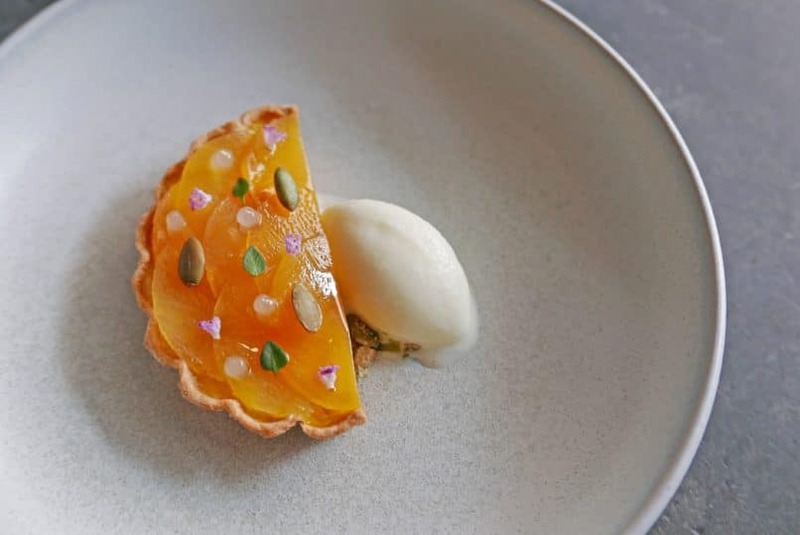 Not dessert: Burrata ice cream and pesto made from locally-farmed herbs adds a refreshing and savoury touch to the Tart of Pumpkin and Persimmon. Take the snacks for instance. Liver from locally-farmed chicken is made into a puree for a savoury take on a Linzer biscuit made with parmesan cheese, topped with raspberry jelly. 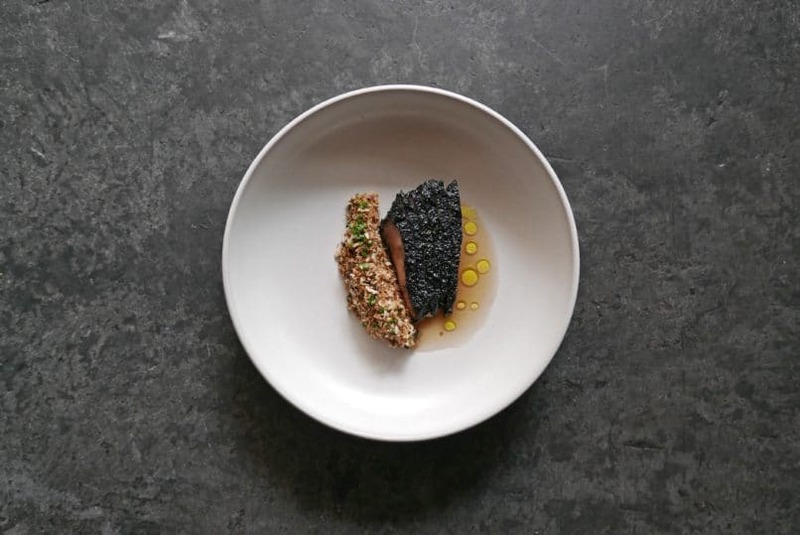 In another named the Cure Egg, local chicken egg is sous vide and served with chicken skin crumble and a smoky potato puree. 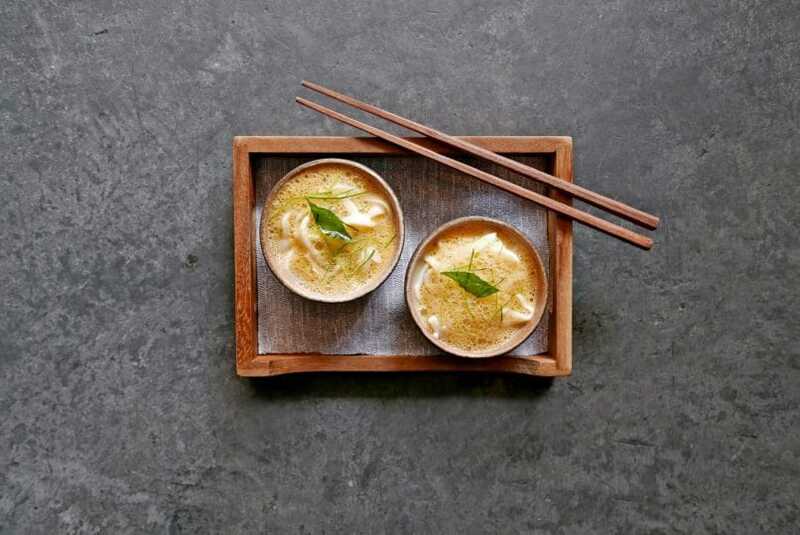 Walsh also pays homage to local flavours with the Singapore Laksa, using squid from local wet markets. The squid is sous-vide and thinly sliced to resemble noodles. The best vegetables of the month are presented in a simple colourful way: dehydrated into thin chips for dipping in a custard of sesame seed emulsion. Only then do the starters arrive at the table, of which there are two. The first came as a seemingly dessert-worthy tart of pumpkin custard, layered with slices of sweet persimmon. The savouriness here comes from burrata ice cream and pesto of locally-grown herbs sneakily hiding under the tart. The second, a mosaic of salmon slices cured to a deep purple in beetroot juice, served with beetroot tartare and creme fraiche. Iberico pork loin also comes with a mushroom dashi made from vegetable trimmings. Depending on the type of menu, diners will get a choice from a series of mains. There’s red snapper with its scales curling up into a crisp, served with fennel and a frothy milk sauce of piquant garlic. Another, the Iberico pork loin, comes coated in edible charcoal powder gently spiked with kampot pepper. The latter comes with binchotan-grilled aubergine served on the side, coated with furikake for an extra kick of spice. For mains, Walsh takes inspiration from the famous pastrami of New York’s Katz Delicatessen with a hefty slab of beef short ribs. Think of it as a deconstructed sandwich minus the bread but with sour cream and a slice of kohlrabi punctuated with a tangy puree of red cabbage. Ending off the meal is another medley of autumn’s star ingredients housed in a meringue. Underneath, a homely jam of fig, apple and pear meets a refreshing basil sorbet. To tighten the sustainable angle further, Cure has also stocked its wine list with organic and biodynamic wines, sourced from artisanal boutique wineries. Cheers, to feel-good dining.